Ciarán is one of the last of his little group of friends to turn 5, and this has led to emotional scenes on the way to many birthday parties this summer as he declares that he doesn’t want the birthday child to be 5 before him. Come to think of it, we had similar scenes last year over his friends being 4 before him too. The result of being one of the last birthdays of the season is that he has been planning his own party since early July. That’s a long time in the mind of a almost five year old, so we have had lots and lots of ambitious plans. When things started to get out of hand Grandad was drafted in to help make and write invitations with Ciarán standing over him dictating names. 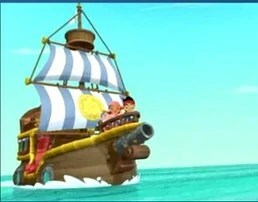 From the outset the theme was set as a “Pirates and Princesses Party” thanks to a lot of advertising on Disney Junior TV channel all summer and I got thinking on the cake. Of course, Ciarán also got thinking, so rather than a simple cake with pirate decoration he decided that his birthday cake (for the rule in our house is that you get to pick your own cake) was to be a pirate ship, and no ordinary pirate ship, but Bucky from Jake and the Neverland Pirates (again, thanks Disney Junior). After a deep intake of breath from me, and some failed persuasion that he might like something easier I admitted defeat and got thinking and googling. The instructions seemed pretty straightforward and I liked the fact that the icing to be used was butter icing as it’s easy to make, tasty and very forgiving when sculpted. Since Cathal’s Gruffalo Cake turned out so well last year I decided to use that exact recipe again, except this time I left out the cocoa as Ciarán isn’t crazy about chocolate cake. I did use chocolate buttercream icing though and made double the quantity that I had made last year and I kept adding extra cocoa until I was happy with the icing being a dark enough colour- so when you’re looking at the recipe remember that. So, having made the cake the sculpting then began. You have a cake made in a roasting tin so it’s a big rectangle. How to cut the cake. 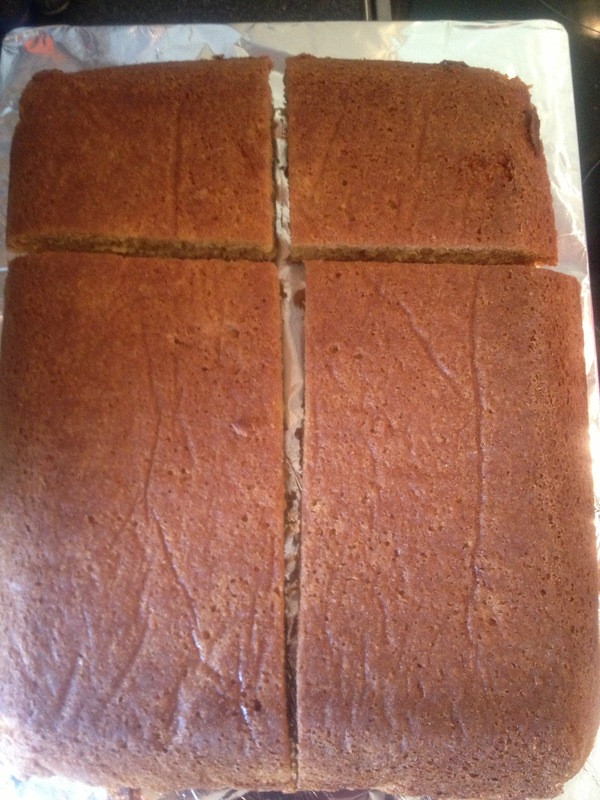 Trim the rounded edges off the cake (perfect with tea) and next, place your two big rectangles on top of each other like this, with the smaller segments on either end for the bow, and back bit of the ship whose name I don’t know, like this. I reckoned that Bucky’s back bit was taller than usual so you’ll see that I added one of my trimmed bits for extra height. 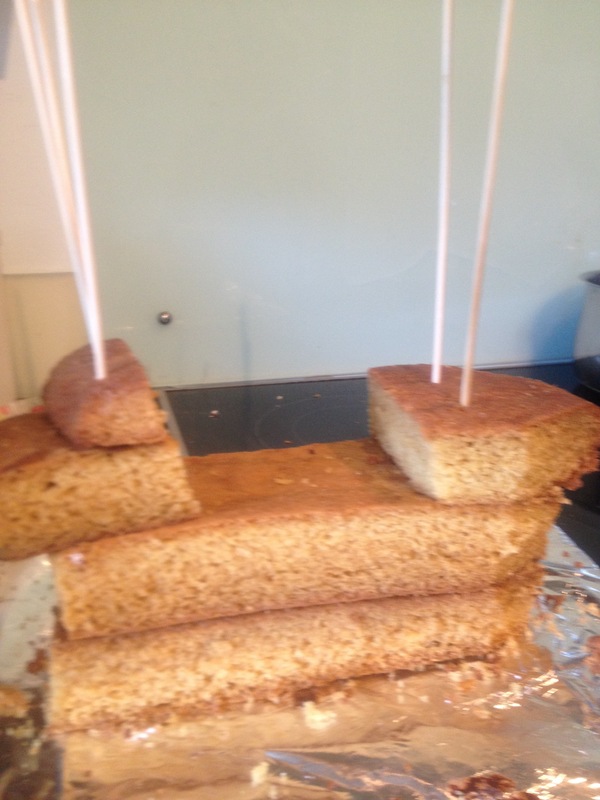 You’ll need wooden skewers to keep the bits together, so pierce the cake with them as shown in the picture and then get a very sharp scissors and trim them so that they’re no longer visible. Then trim the front of the boat (the bow) into a point. Next, the fun part. COVER the cake in chocolate buttercream icing. I used chocolate fingers at the front and back and around the side (where Izzy is standing). The portholes are apple rings but can be any circular sweet. I decorated the front and back with smarties as my kids expect their birthday cakes to be decorated with as many sweets as possible. I used a thick strawberry lace type sweet for the red slide, as I was told that this was an essential part of Bucky. I had meant to add another chocolate finger sticking out of the front as a cannon but forgot. The mast is a skewer and I made the sail using two pieces of card, one bright blue and one white, I cut the blue card into strips and stuck the blue strips on to the white card with glue. We had a gold circle from a make and do kit so Ciarán drew on it, I had wanted to use the wrapper from a chocolate gold coin, that made the gold doubloon. We didn’t have any Jake character toys so I bought character cupcake toppers from this seller and placed them around the cake, using the leftover ones to top iced buns and Rice Krispie buns. The cake went down really well and looked impressive (in a home made way) on the table for the party. Rear view of cake. Yes, I was lazy and only stuck white stripes on the front of the sail. 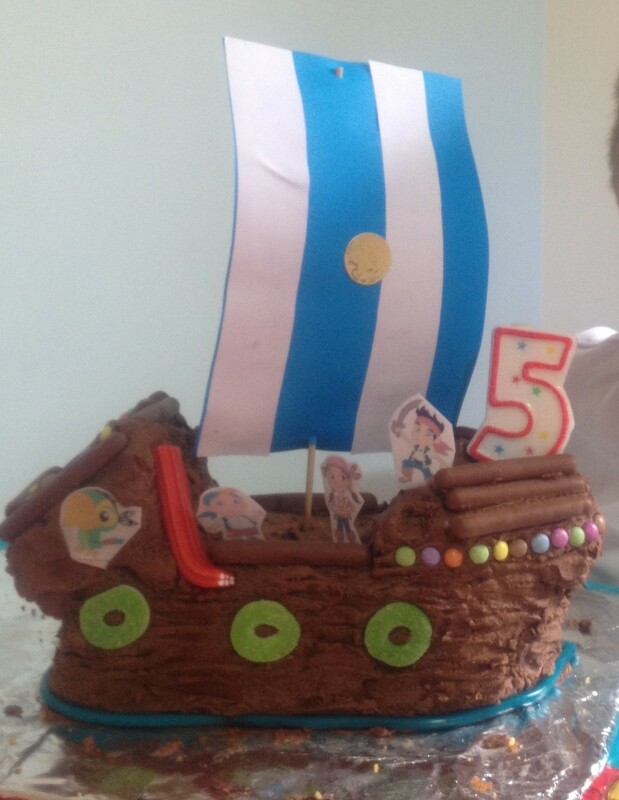 5th birthday party, cake, pirate cake, pirate party, pirate ship, recipe. Bookmark.